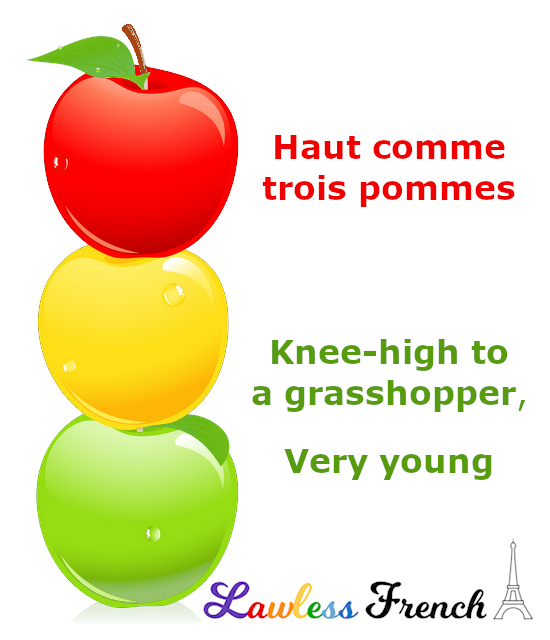 Usage notes: The informal French expression haut comme trois pommes is a charming way of referring to a child’s height. For me, it is forever linked to my little brother’s obsession with the Smurfs, who were described as "three apples high." This always confused us, since the Smurfs were actually just a couple of inches tall – smaller than a single apple, much less three. It finally made sense years later when I discovered that the Smurfs were in fact les Schtroumpfs, created by the Belgian artist Peyo for Le Journal de Spirou, and he’d described them as hauts comme trois pommes. It was cute but somewhat unfortunate that the translator chose to translate the term literally. The equivalent English term is the somewhat old-fashioned "knee-high to a grasshopper," but of course this can’t literally describe a child’s height; rather, it’s a reference to a young age. J’étais haut comme trois pommes quand j’ai vu ce film. I was knee-high to a grasshopper when I saw that movie. Hélène est haute comme trois pommes, elle ne peut pas faire un tour de montagnes russes ! Hélène is tiny, she can’t go on a roller coaster! Previous How are you? Fine.